When did Chinese characters originate? This question has interested Chinese calligraphers as well as linguists. No verifiable source was ever found in ancient Chinese history. Legend says that during the reign of the Yellow Emperor ( 黃帝 ) Tsung Jie ( 倉 頡 ) invented the Chinese characters. Calligraphy came with invention of the characters as the Chinese people found a beautiful way to write and began to appreciate the beauty. We may attribute the invention to 4,600 years ago, but this was only a legendary tale and may not be credible. 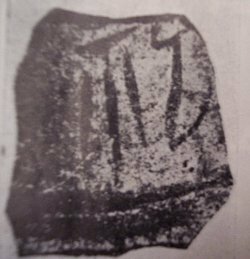 Oracle Bone Inscription “Gia Gu Wen, or Jia Gu Wen 甲 骨 文” was considered one the earliest kinds of Chinese characters that have been discovered. But Gia Gu Wen was not yet a fully mature written form from linguistic points of view. Artistically speaking, the brush strokes and structural beauty of Gia Gu Wen had set foundational and theoretical standards for the Art of Chinese Calligraphy from many artistic perspectives. Gia Gu Wen, indeed, is a major style of Chinese calligraphy. It would be ignorant not to consider Gia Gu Wen to be Chinese calligraphy. 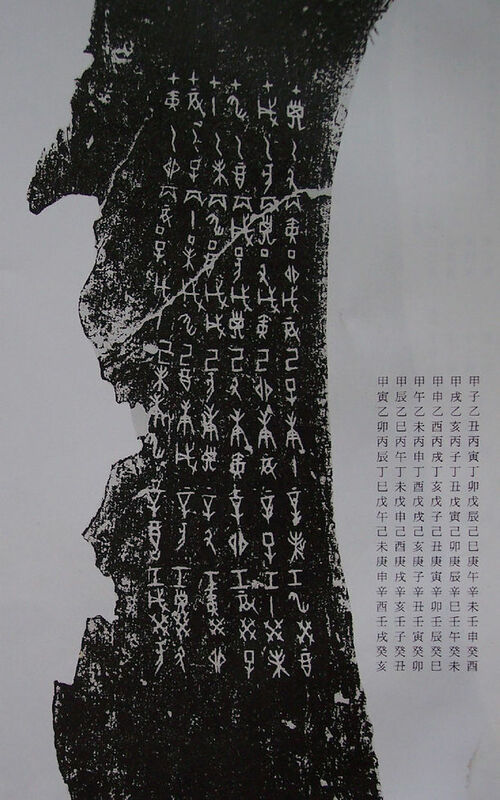 The language discovered before Gia Gu Wen was Pottery Writing “Tao Wen 陶 文”. Tao Wen was a language far more from mature. Actually it's hard to be considered a written language. People think there should be some transitional languages between Tao Wen and Jia Gu Wen. But no verifiable archaeological evidences have been discovered so far. Ancient Chinese characters might have told stories of the Bible. Is it coincidence or design? Visit the following videos and find interesting stories. 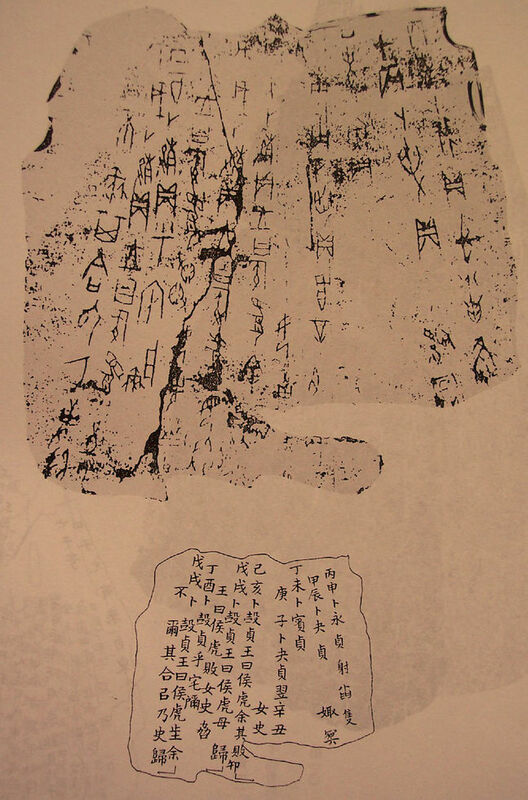 Inscriptions on oracle bones were widely considered to be one of the earliest forms of writing in ancient China. 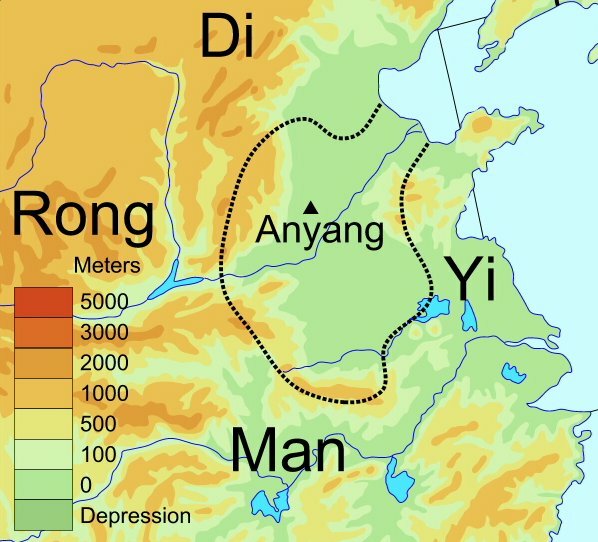 As early as 3600 years ago, during the Shang Dynasty ( 商朝 ), its use was already widespread. The Shang people’s deep belief in ghosts and spirits prompted them to seek otherworldly advice through divinations. These inscriptions carved on tortoise plastrons and animal scapulae served to record the auspicious or inauspicious results of the divinations sought by the priests. The oracle bones yield information concerning the Shang Dynasty’s wars, agriculture, mythology, history, and so on. They revealed a mythical element that pervaded all aspects of their daily lives. Oracle Bone Inscriptions on different shapes of bones. These are the early masterpieces of Chinese calligraphy. Although Oracle Bone Inscriptions (Gia Gu Wen, 甲骨文 ) already existed 3600 years ago, they were not discovered until 1899, during Emperor Guan-Hsu’s ( 光緒皇帝 ) reign in the Ching Dynasty. The Institution of History and Philology of the Academia Sinica carried out a series of excavations and archaeological fieldwork at Hsiao-Tun Village ( 小屯村 ) , An-Yang County ( 安陽縣 ) of the Henan Province ( 河南省 ), from 1928 to 1937. Many tortoise shells and animal bones were uncovered, drawing a large number of scholars and experts to study and interpret the inscriptions. As a result, the study of Oracle Bone Inscriptions has emerged to be a new topic of Chinese calligraphy. Later Gia Gu Wen was still used in the Western Zhou Dynasty (1046-771 BC) although Great Seal Style (Da Zuan, 大篆 ) was also used at that time. Great Seal Style was a transitional type of writing between Gia Gu Wen and Small Seal Style (Shiao Zuan, 小篆 ). Gia Gu Wen already was written very artistically. Yet the total number of decipherable characters of Oracle Bone Inscriptions was about 2000. Recently, the decipherable numbers of Gia Gu Wen have increased. Following Gia Gu Wen were inscriptions cast or carved on ancient bronze objects of the Shang and Zhou Dynasties. They are called “Jin Wen 金文” (literally, script on metal) and, as ancient bronzes are generally referred to as “zhong ding, 鐘鼎” (bells and tripods), it is also called Bronze Inscriptions (Zhong Ding Wen 鐘鼎文 ). The bells and tripods became a ritual object and a sign of power, and the owning of such tripods was a status symbol of the Shang slave-owning aristocrats. At the beginning only the names of the owners were cast or engraved on the tripods. Later the tripods and other bronzes began to carry longer inscriptions stating the uses they were put to and the dates they were cast. The contents might include wars, treaties, agriculture, and history. Thus the inscriptions on bronze objects grew longer, from a few characters to a few hundred, from simple phrases or pictures to detailed statements and treaties and thus the varieties of calligraphy styles increased.